Got a late start because of some work stuff in am. Weather looked great so we headed south looking for birds. 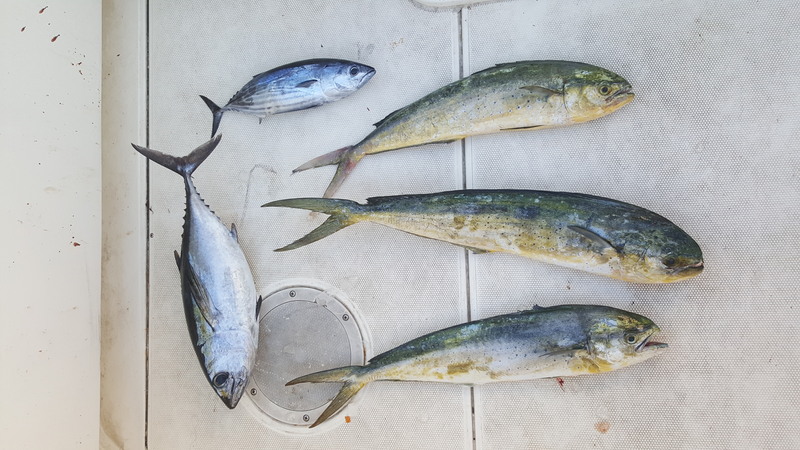 Todays target was Mahi and head to the hump for a quick trip. Found a weed line at about 700’ with a few other boats working it. Got in line and put spread out, 2 jet heads, 1 triple d and a skirted hoo. Trolled the weeds for a while no signs of fish or birds for a long time. When we finally saw a couple birds a double hook up followed shortly after. Got a decent cow in the boat and the second fish fought hard. Finally got it to the boat but a long leader and short gaff allowed this nice bull to come off boat-side. Made a couple loops in this area with no knock downs so off to the humps. Approaching there are only a few boats there and we look for birds and put out the Mahi/tuna spread out. Doesn’t take long and we have a double. Lost one to a shark and the other is a skippy. We trolled around the edges and get several knock downs, 1 nice BFT and several shark attacks. See George P filming there looks like Jimmy G is with him. As we head back find a nice weed line on the backside rip. We stop and play with some schoolies for a while. We only keep a few since we just filled the freezer 2 days ago. All in all a great day on the water and the viz should be great tomorrow. Til next time tight lines.